Move over Lars von Trier, there is a new provocateur in town. Darren Aronofsky‘s latest film Mother makes a return to the psychological horror the director made a name of himself for with Black Swan, Pi, and most notably Requiem for a Dream. Never one for subtlety, Aronofsky enters full-bore, envelope-pushing mode here and, in turn, creates one of the most ambitious and boldest films to be produced by a major studio this decade. 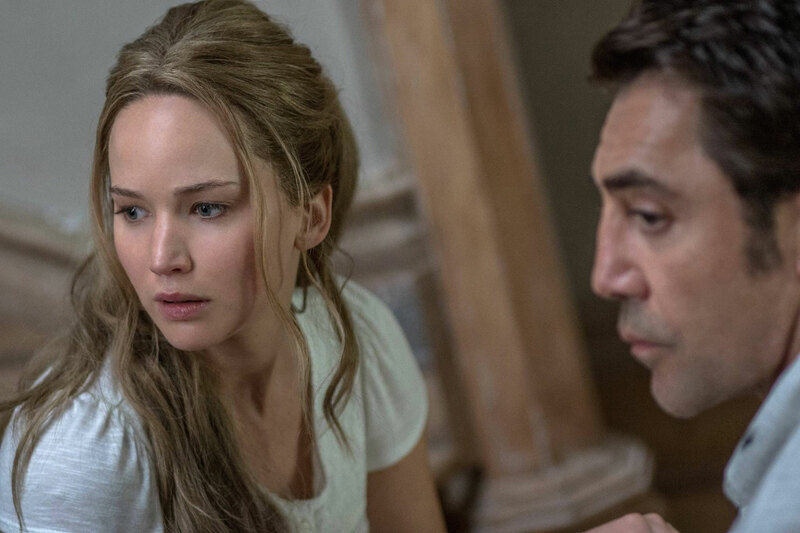 Playing the role of Mother and Him respectively, Jennifer Lawrence and Javier Bardem are a seemingly happy couple living in a remote countryside house so he can focus on his poetry. From the film’s opening moments however, we realize that the couple isn’t quite as happy together as they ought to be. He has an empty frustration sustained from a lack of creative inspiration and Mother seems disillusioned and dissatisfied with the lack of romance in the relationship. This is where the mysterious doctor (Ed Harris, whose character is referred to simply as Man) makes an appearance and becomes the first in a series of unwelcome visitors. The series of narrative events that follow seem to ping-pong between a haunted house mystery, domestic melodrama, psychological thriller, and allegorical horrorshow that escalates to madness as the film progresses. Aronofsky is a master at diving deep into the headspace of his characters (often with disturbingly nihilistic results) and we witness the chaotic events unfold from Mother’s point of view without missing a beat. Scenes are beautifully shot by frequent Aronofsky collaborator Matt Libatique and stitched together by editor Andrew Weisblum. The film seems to take on a time and space of its own making; events don’t necessarily flow from one to the next as much as they seem to be taking place all at once simultaneously – or perhaps not even occurring at all. It’s obvious that Aronofsky is trying to provoke the hell out of his audience, and he has a masterful knowledge of film language to do just that with tremendous effect. As with any great piece of cinema, every aspect of the frame and beyond works in conjunction with the whole of the story to accomplish a specific vision. Here, Aronofsky’s goal is to deliver a tour de force of Mother’s ever-changing perspective to the audience in a brazen, unrelinquished fashion. Bottom Line: Mother! is an unflinching allegorical nightmare running on all cylinders and a masterful showcase for Aronofsky’s audacious and unapologetic vision.